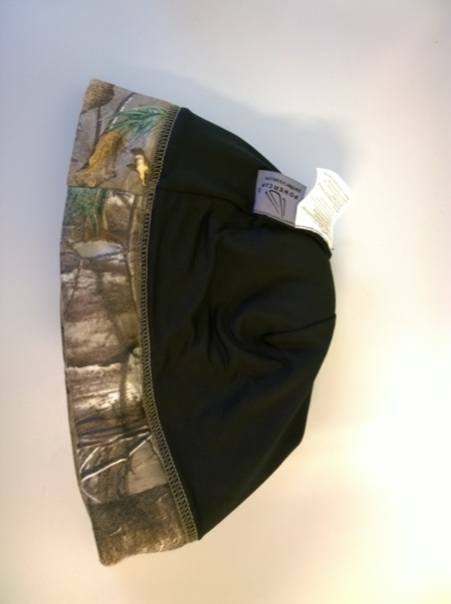 HomeOutdoor ClothingPower Cap and LED Beanie Review – Gimmick or Useful? We reviewed an LED Power Cap, LED Beanie, and LED Clip-on light. Are these just gimmicks or are they a useful bit of kit to have when outdoors? We put them to the test. 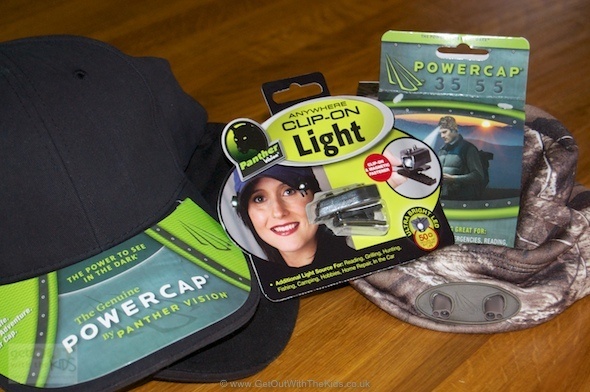 The Panther Vision PowerCap, PowerCap Beanie, and Clip-on Light. Putting lights in a hat that you wear outside makes perfect sense. 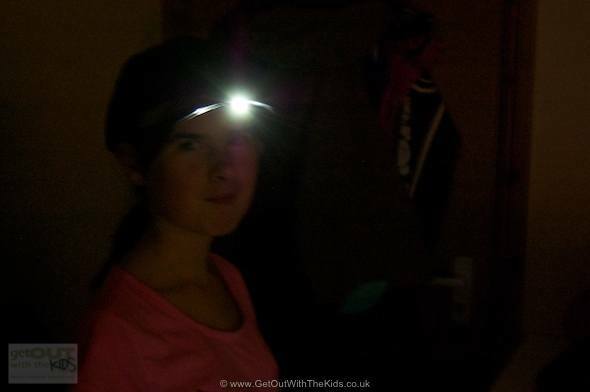 But with great head torches (such as this one we reviewed from Petzl) are they necessary? And are they just a gimmick? We’ve trying these out along with Shane from @ShropshireWalks, who’s been putting the LED Beanie through a thorough test on the remote Shropshire hills. The Power Cap looks just like a normal cap. In fact, you can even get caps branded for your organisation or club, as well as getting caps that fit adults and children. But these caps carry a secret: they light up! We tried two caps: one had four LED lights, and one had three. You can cycle between just one set on or all on. The LEDs are suspended from under the peak of the cap. They are small and not obvious to people looking at the cap, and don’t block your vision when wearing the cap. The cap with three lights had its third LED embedded at the front of the cap’s peak. Also on the peak, is a hidden switch underneath the fabric. One click and you light up. 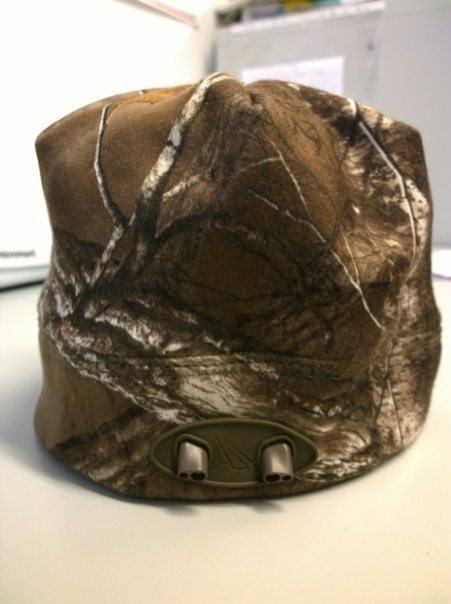 The batteries are the large round flat ones, and are hidden away in the lining of the hat. You don’t even notice they are there when wearing it. So, enough of the technical stuff, are they any good? The LEDs are extremely bright and are perfect for things like reading a map or doing something with your hands. 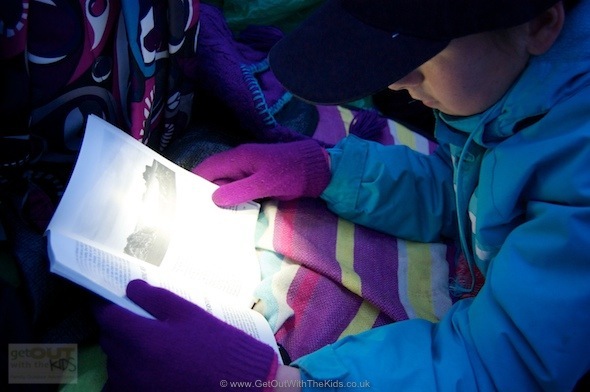 Here one of our children used the hat on our Winter Night Microadventure to read us some ghost stories about the area. They are also lightweight, and you don’t need hat and head torch. Now they are not going to light up the path quite as much as some head torches, but that’s not what they are really for. The LED Power cap gets a thumbs up from us, and a useful bit of kit for outdoor activities such as hiking or camping. You can find more about the LED Power Caps here on the Cap Light website. I have several things in my outdoor equipment store that I obsess over. The two that stand out the most are flasks and torches. Ever since I was a kid, torches have fascinated me. I clearly remember how excited I was when I received a little black plastic torch as a child, and how I would hide behind the sofa, and pretend I was in some subterranean passageway, with only my trusty torch for companion. Through into later life, I still recall the day I bought my first proper Maglite, how far the beam reached and the fact that you could focus it. I still have it, 22 years later, by the side of my bed, in case of power cuts!. Moving on into the 21st century, and in the intervening years, I’ve bought enough head torches, key ring torches, and plain old torches to start my own museum. In the last couple of years, we’ve seen a revolution with our torches, and that is with the advent of the LED torch. LED’s are nothing new, but what has moved on is their colour and intensity, and how that can be applied to torch manufacturing. I have several head torches incorporating LED technology, and am currently using a budget one that has an output of 2000 lumens (nearly the same as 170W mains powered bulb), but this is a fairly bulky affair, and not fit for the majority of simple tasks. A fellow Twitter user recently caught my eye when they were advertising “LED Beanie Hats”. At first glance, this looked like a woolly hat with a couple of LEDs shoved on the front, but upon closer examination, it appeared to be a little more. I set about acquiring one, and have now been using one for 2 months. I’ve used it for a variety of purposes, including photography, navigating and de-icing the car. To my mind, an LED Beanie hat has to serve two purposes. To be a head torch. So, how does it fare with these tasks? Well, firstly, let’s consider its performance as a hat. I’ll be honest; I don’t use hats that often. After a long military career, and being driven daft by a beret, I find hats tend to “irritate” me. In my outdoor life, it has to be really cold for me to wear a hat, and even then, I’m more likely to just pull up my hood. I tend to find that woollen hats are the worst offenders for irritating me, they just make me want to scratch my head, and fleece based hats, just make me too hot. Which is perhaps aimed more at those interested in pursuits such as hunting, shooting or fishing, but as I’m not particularly a fashion guru, it didn’t bother me. Given that these are fairly common activities in these parts, it has received many positive comments from people, and has been likened to Duck Commander products from the TV programme Duck Dynasty. It’s big enough that it can be pulled a fair way down the back of my head, and it meets the collar of any jacket I wear, thus keeping out the wind, and it also has enough depth to almost fully cover my ears too, which is a bonus with a shaved head!. In summary, from a hat point of view, it’s comfortable, warm, practical, well made and light weight. The second function of this LED Beanie hat, is the LED/Head Torch aspect. 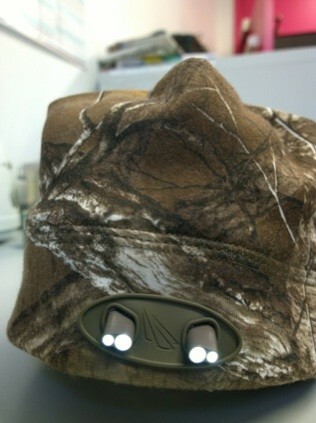 On the front of the hat, in a rubberised section there are 4 LED’s pointing forwards. The 4 LEDs provide more than 48 Lumens (the SI unit of luminous flux, equal to the amount of light emitted per second in a unit solid angle of one steradian from a uniform source of one candela). “When you click the easy on/off switch hidden in the band, you’ll notice that 2 of the LEDs are angled down at 55 degrees to light up where your hands are for close up tasks, while the other 2 LEDs are aimed forward to light the distance up to 42 feet away. (4) CR2032 Coin Cell batteries hidden in the band provide up to 43 hours of life and are easily replaceable”. For me, the power pack/on-off switch sat just above my left ear, but I suppose this might differ, depending on the circumference of your head. The button is easy to locate through the material, without having put your finger inside the hat or fiddle with anything. The light emitted from the LED’s is a very “cool” white colour, and has a reasonable intensity for close up work. I found it to be particularly useful for things like map reading and photography, where it gave the perfect amount of light, and, more importantly, at the perfect angle for doing things within arm’s reach. For things further away than arm’s length, with fresh batteries, you get a reasonable amount of light. I don’t know if it is as far as the claimed 42ft+, but in pitch black circumstances, it gives adequate lighting for following a decent path. It’s by no means a search beam, and does not substitute a full on dedicated head torch, but gives an adequate amount of light for casual outdoor use. In conclusion, I found the LED Beanie hat to be a very comfortable and practical hat, a good head torch for close up activities (DIY, map-reading, photography etc…) and a reasonable torch for outdoor use. It is a well-made and very practical item for anybody to have hanging up by their front door. You can find more about the LED Beanie light here on the LED Beanie hat website. 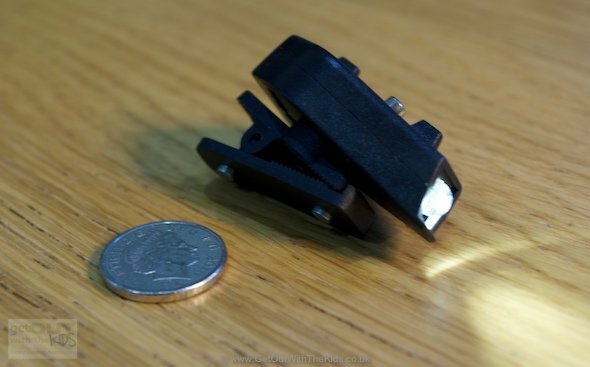 The Clip-on light is very small and lightweight. But what if you have a cherished hat and don’t want a cap or beanie? The clip-on LED light is the answer. We found that this little light on its own wasn’t as bright as all the LEDs on the cap, but it is actually a handy bit of kit as it is not limited to just hats. You can clip this LED onto anything that’s thin enough. And it’s small too (look at the picture of it next to 5 pence). The Clip-on light has been very useful. 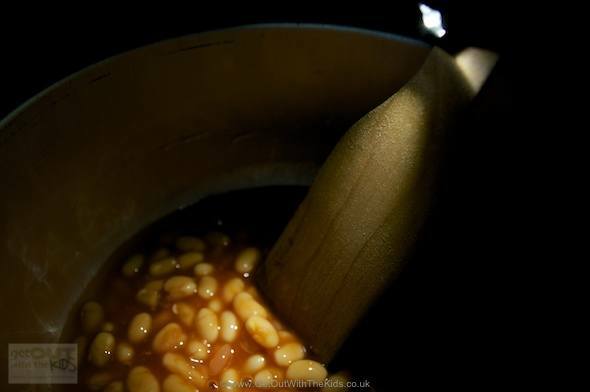 It even created this LED wooden spoon to help with cooking at the campsite after dark. You can find more about the Clip on LED light here on the cap light website. Disclaimer: With thanks to Power Cap for supplying us with some LED Caps so that we could write a review of their product. All opinions are our own. Where to Buy: Power Cap and LED Beanie Review – Gimmick or Useful? Shane is a married Dad of two and proud native of the Shropshire Hills. He has spent several years living in the Lake District and served all over the world in the British Army, where he was a Mountain Expedition Leader. A keen outdoorsman and hillwalker/mountaineer, these days he works in education and is a Gold Duke of Edinburgh Assessor. Proud of the hills he grew up in, he can usually be found with his camera in hand, trying to convince his kids (sometimes successfully) that being outdoors is more fun than the TV!